This week, we welcome guest blogger Jim Zajac, President of the East Hampton Trails Preservation Society, who is one of the mentors guiding our seven student interns from East Hampton High School as they learn about Montauk’s natural environment. Jim is a wealth of knowledge and we encourage you to get to know and join him on EHTPS’ regularly scheduled guided walks. I recently hiked part of the Point Woods section of the Paumanok Path through Camp Hero and thought I’d share with you some of what I saw. Three native plants — 2 evergreen and 1 deciduous — really stand out in mid-April. The two evergreens — American Holly and Mountain Laurel — both large shrubs or small trees, compete for space along much of the trail. Together they create a beautiful, low canopy just overhead, well below the larger deciduous trees that dominate the forest. Leaves of the two evergreen trees are similar in size and both are glossy, but there the likenesses end. 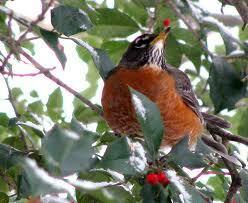 The leaves of the holly are scalloped, with sharp points, whereas Mountain Laurel leaves are oblong and smooth. Trunks of holly trees grow fairly straight and are colored off-white with tan accents; Mountain Laurel trunks twist and turn, their color is a beautiful cinnamon. Mountain Laurel comes into flower in our area in early June, with subtle blossoms of small white flowers tinged with pink. American Holly is a dioecious, or sexed plant — trees are either male or female — and the female trees produce a small red berry. Both plants have been coveted and cultivated by gardeners for a long time; the native plants, as well as variants, can be found in our local plant nurseries and gardens. The third plant now vividly on display is Skunk Cabbage. It can be found abundantly in more low-lying, wet areas; it looks like a cabbage or lettuce. If you break off a leaf, crush and smell it, then you’ll understand the rest of the name: I wouldn’t say it smells like a skunk, but the odor isn’t pleasant. To me, it smells like a new bicycle tire, and not in a good way. About 15 minutes from where I parked, I encountered a large spill of what look to be erratic boulders, or glacial erratics — perhaps the largest collection in town? From the internet you can glean plenty of information about these geological oddities.